Everything you need comes with the Crystal sewage treatment plant, but some sites require deeper inverts for the inlet/outlet pipes to or from the plant. Most Manufacturers will supply any length of neck extension up to 1.5 metres, with no regard to the fact that if something goes wrong inside the unit, you have to be able to reach the internal pipe-work from ground level. If a 1 metre neck extension is installed, this is impossible and the unit cannot be repaired or serviced. 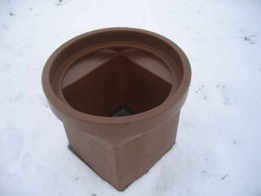 For this reason, Crystal ECO only supply sewage treatment units with a MAXIMUM neck extension of 300mm. Any deeper inverts are accommodated by means of body extensions which deepen the invert levels of the inlet and outlet pipes, whilst keeping the working parts at the same depth below ground.